Matsumura (2016) stated, “ecotherapy changes cognition, emotion, and physiology that are positively valued and/or enhance effectiveness and adaptive capacity (p.3).” By incorporating nature into therapy using rocks, shells, or plants or collaboratively agreeing with the client to have their therapy session on a walk in the forest there could be a substantial increase in the level of therapeutic transformation in the client. While I was at colloquium I took a workshop on the use of nature for therapy. The first exercise we were asked to do was to notice the emotional climate and shift that happens in each of us as we move from an enclosed space to walking outdoors. Then the Eco therapist asked each of us to pair up with one other person and find anything in the natural environment surrounding us such as the rocks, flowers, creek, or even just one small patch of grass. Once this is done I was to lead my partner with her eyes shut to a big rock I had chosen near the creek for my partner to sit, take in, and be aware of their emotional atmosphere in the here and now. This was to take place for 7 minutes, then we would switch and do the same thing. After both people have played the part of the therapist and client they take 7 minutes to discuss what happened for them in the time they sat with the chosen natural object. This exercise gives the client time to pause and be mindful of her natural surroundings and allow the answer to come. In the business of everyday life, it is easy to become overwhelmed. If we stop and listen through interactions in the natural world conclusions can unfold right before our eyes. Another therapeutic exercise may simply be taking the client on a walk and asking them to become aware of everything in their environment and let it speak to them. For instance, the therapist asks the client to scan from left to right and point out what they notice then define why they noticed it. For instance, the roots of the trees are connected to one another which seems to make them stand up stronger. The therapist can use this as a means to explore how this relates to the client personally. 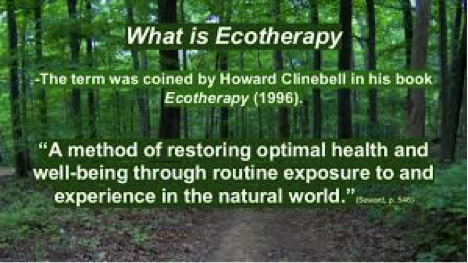 Thus, the very essence of ecotherapy is utilized for highlighting the positive impact that nature creates within the human psyche while bridging the gap within the whole person (Matsumura, 2016).